Kolby passenger and car ferry ticket prices, timetables, ticket reservations and information for ferries sailing from Kolby to Hou, Saelvig and Kalundborg. Compare all available Kolby ferry ticket prices in real time and book the cheapest available Kolby car and passenger ferry tickets sailing to and from Kolby, Hou, Saelvig and Kalundborg with Samsotrafikken Ferry Line ferries online with instant confirmation. Book Kolby Kas Ferry Tickets with Samsotrafikken Ferry Line for ferries sailing from Kolby to Hou, Saelvig and Kalundborg online in advance to enjoy the cheapest available ferry ticket price. The price you see is the price you pay. There are no hidden extras or surprises such as added fuel surcharges or booking fees and we do not charge you anything extra for paying with a Visa Electron card. The price we quote you for your selected Kolby passenger or car ferry ticket, onboard accommodation and vehicle type is all you will pay, and that's a promise. To obtain a Kolby ferry ticket price and book your ferry ticket securely online please use the real time ferry booking form on the left. You are also able to add a hotel at your destination, or anywhere else, to your ferry ticket when completing your ferry ticket reservation. Kolby Kas port is located on the beautiful Island of Samso in the Kattegat, just 9 miles off the main Jutland Peninisula in Denmark. Kolby Kas is the second main passenger ferry port on Samso after Saelvig, and is conveniently located on the south-west coast with easy access the rest of the Island. At Kolby Kås ferry terminal you can park your car, buy tickets and stretch your legs while you wait for the ferry, and continue your journey by bus or taxi. Read about Kolby Kås ferry terminal and the local area in the menu on the left. From Kolby Kås on Samsø, the ferry takes foot passengers, cars, motorcycles, mopeds and bicycles to Kalundborg onZealand. The crossing time with SamsøFærgen is 1 hour and 50 minutes. Kolby Kas Harbour belongs to Samso Island Port Authority and it is Harbor. Samso Island is very popular amongst tourists, especially during the peak summer months when fruit picking is a favourite past-time, and the beautiful countryside comes to life. Visitors can jump on one of the frequent Island bus trips which stop at the ferry ports throughout the day. Best Price Guarantee - We always offer you our lowest available Samsotrafikken Ferry Line passenger and car ferries ticket price to and from Kolby. There are no hidden extras or surprises such as added fuel surcharges or booking fees and we also we do not charge you anything extra for paying with a Visa Electron card. The price we quote for your selected Kolby ferry ticket, onboard accommodation and vehicle type is all you will pay, and that's a promise! In the unlikely event you find the same all inclusive Kolby ferry ticket cheaper in the brochure of any other tour operator we promise that we will do our best to beat that price or offer you the choice of requesting a refund. 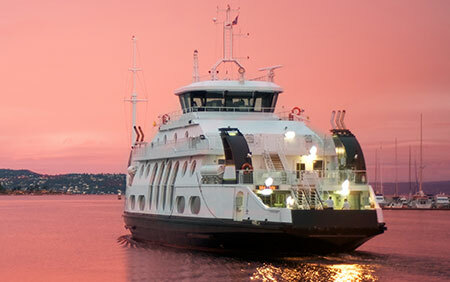 To book Kolby car and passenger ferry tickets please click here. At ferryto.co.uk you are able to obtain live Kolby ferry ticket prices, check availability and book car and passenger ferry tickets to and from Kolby at our lowest available ticket price. Ferryto.co.uk is part of the world's largest online ferry ticket distribution network providing the ability to book over 80 major European ferry operators including to Kolby and to over 1,200 other ferry routes throughout the UK, France, Spain, Ireland, Holland, Eastern Europe, the Mediterranean, the Baltic and North Africa.